These soybeans were damaged in 2017 by dicamba, a popular weedkiller that's prone to drifting into neighboring fields. Some farmers in the state are defying efforts by regulators to strictly limit use of the chemical. "Honestly, I don't think anybody in the whole world dreamed the dicamba could create such an issue, bring so many farmers against farmers," says Terry Fuller, a member of Arkansas' state plant board, which regulates pesticides. When farmers started spraying dicamba on these new crops, the chemical didn't stay where it belonged. It drifted across the landscape and injured millions of acres of regular crops. The problem was especially bad in Arkansas. Farmers who sprayed dicamba loved it, but Fuller and the plant board decided that the collateral damage was unacceptable. "Trespassing on your neighbor and your friend, that's not my definition of good for business," he told me last year. So the plant board passed the most dramatic limits on dicamba in the country. They banned spraying dicamba after April 15 each year — which covers the entire growing season. By mid-June of this year, though, it was clear that some farmers were defying the ban, especially in Mississippi County, in the northeastern corner of the state. 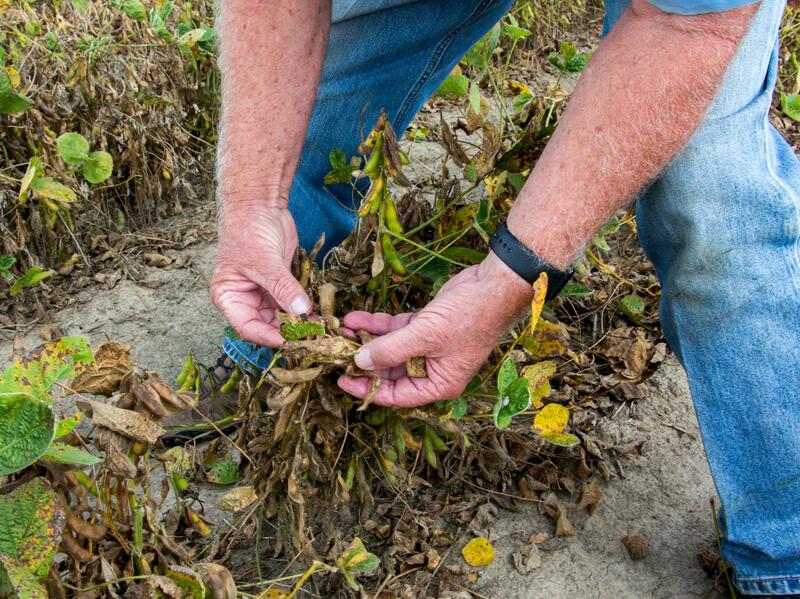 Thousands of acres of soybeans that couldn't tolerate the weedkiller, as well as trees in people's yards, once again were showing the classic signs of dicamba damage: curled leaves and stunted growth. Fuller called it "a sad situation. Really, an unbelievable situation." Faced with a challenge to its authority, the plant board got aggressive. It didn't wait for other farmers to report cases of damage; most of the time those complaints didn't lead to an obvious culprit. It was impossible to figure out where the dicamba fumes came from, because they can drift for a mile or more. Instead, inspectors went looking for direct evidence of illegal spraying. They collected dying weeds that looked like they were sprayed with dicamba and took samples from farmers' spray rigs. In at least a couple dozen cases, these samples tested positive for the banned chemical. Farmers are now facing investigations that could lead to fines of at least $1,000 and up to a maximum of $25,000 per violation. I talked to two farmers who are named in the plant board's investigative documents, as well as to two others who are familiar with these investigations and support the farmers' cause. They didn't want me to use their names because they didn't want to get in more trouble with regulators. They told me that the decision to use dicamba comes down to economics. Some believe that Monsanto's dicamba-tolerant seeds will produce a bigger harvest. One farmer told me that spraying dicamba is the only way to stay in business and that paying the fine is cheaper than fighting weeds any other way. The state's crackdown on dicamba did seem to have an effect. The number of formal complaints about damage from drifting dicamba declined sharply this year, from almost 1,000 last year to about 200 in 2018. The fact that some farmers are determined to keep spraying dicamba, however, is putting enormous pressure on others who are farming by the rules. One of those farmers is Tad Nowlin, who farms land in the northeast corner of Arkansas and just across the state border in Missouri. "Personally, I don't believe in spraying dicamba. I think it's too dangerous to spray," Nowlin told me. "I mean, anybody that says otherwise is dreaming." So he didn't plant those new dicamba-tolerant crops. He got rid of weeds with other chemicals. "I used not one drop of dicamba. So anybody who says it can't be done — it's a myth," he says. But then he watched the leaves on his soybean plants curl up. Dicamba had blown in from somebody else's field. He doesn't know which neighbor broke the law. But describing the damage, there's intense frustration in his voice. "Do I go out and witch-hunt people, and find — I'm not doing that. But I have a legal right as a farmer to keep a crop that is not damaged by somebody else's spray," he says. That legal right might not be enough, though. If other people insist on using dicamba, he may be forced to plant those new dicamba-tolerant soybeans because those plants won't get injured. And if he does that, he'd be tempted to spray dicamba, too. State regulators in Arkansas have banned the use of a weed killer that's popular not just there but across the country. This chemical often hurts other crops and wildlife. But many farmers in Arkansas are defying the ban, and the state's having trouble enforcing it. NPR's Dan Charles has the story. DAN CHARLES, BYLINE: This year's confrontation actually started with a farming fiasco last year. The company Monsanto, which is now owned by Bayer, rolled out a new way to kill weeds. It told farmers, we've created some special new varieties of soybeans and cotton. They can tolerate a weed killer called dicamba. So you can spray dicamba, and the crops will be fine. But your weeds will die. Terry Fuller is a member of the Arkansas State Plant Board, kind of the pesticide police. TERRY FULLER: Honestly, I don't think anybody in the whole world dreamed that dicamba could create such an issue, bring so many farmers against farmers. CHARLES: Dicamba didn't stay where it belonged. It drifted across the landscape. It injured millions of acres of regular crops. It was especially bad in Arkansas. Farmers who sprayed dicamba loved it, but Terry Fuller and the state plant board decided the collateral damage was unacceptable. I talked to him about it last year. FULLER: Trespassing on your neighbor and your friend - that's not my definition of good for business. CHARLES: So the plant board passed the most dramatic limits on dicamba in the whole country - no dicamba spraying during the growing season. This summer, I called Terry Fuller back to see how it was going. And he told me it was happening again - thousands of acres of crops damaged, also trees in people's yards. This was not supposed to happen this year. FULLER: Not supposed to happen this year - you're absolutely correct. It's just been a sad situation and, you know, really an unbelievable situation. CHARLES: The plant board's investigators tried to catch the outlaw farmers. Inspectors drove country roads looking for dying weeds that looked like they'd been sprayed with dicamba - took samples, tested them. In at least a couple of dozen cases, they found the banned chemical. Those farmers now could face fines - at least a thousand dollars, possibly $25,000 per violation. I talked to a couple of those farmers and some of their supporters. They did not want me to record those interviews or use their names. They told me spraying dicamba was a business decision. Some of them think Monsanto's dicamba-tolerant seeds will give them a bigger harvest. One said spraying dicamba is the only way to survive. A couple of them said paying the fine is cheaper than fighting weeds any other way. And by defying the ban, they're putting enormous pressure on the farmers who are farming by the rules, like Tad Nowlin. TAD NOWLIN: Personally, I don't believe in spraying dicamba. I think it's too dangerous to spray. I mean, anybody that says otherwise is just dreaming. CHARLES: So he didn't plant those new dicamba-tolerant crops. He got rid of weeds with other chemicals. NOWLIN: I used not one drop of dicamba. So anybody that says it can't be done, it's a myth. CHARLES: And then he saw the leaves of his soybean plants curling up. Dicamba had blown in from some other farmer's field. NOWLIN: Do I go out and try to witch-hunt people and find it? I'm not doing that. But I have the legal right as a farmer to keep a crop that is not damaged by somebody else's spray. CHARLES: That legal right may not be enough, though. If other farmers insist on spraying dicamba, he may have to also plant those new dicamba-tolerant soybeans because they won't get injured. And then he'd be tempted to spray dicamba, too. (SOUNDBITE OF DANNY ELFMAN AND NICK INGMAN'S "REBUILDING") Transcript provided by NPR, Copyright NPR.